When properly protected, your commercial drywall will be able to provide decades of lasting quality, enveloping your spaces in welcoming surfaces that provide thermal, structural, and fire safety advantages in addition to aesthetic benefits. Drywall finishers will be able to deliver precise textures and colors to truly capture the tone and quality of your business. While wallboard has evolved to become a valuable building material, it can quickly become compromised if exposed to high amounts of moisture. Standing water, vapor, and every state in between can infiltrate the core of your drywall, spoiling structural integrity and environmental safety in the process. 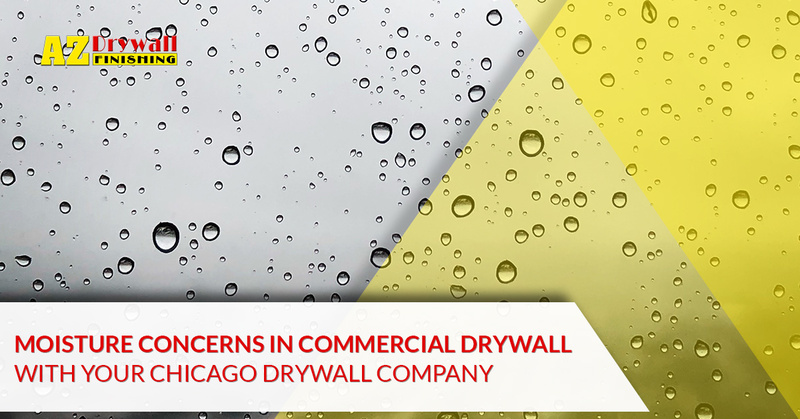 It’s important to procure professional drywall installation to minimize the chances of error for future moisture concerns in buildings across Illinois, and that is where our drywall contractors in Chicago can prove useful. For years, AZ Drywall Finishing has worked to provide results to each and every client we assist. Our commercial drywall company specializes in metal stud framing for new builds, such as franchises, and additions to remodels and more. We have the experience and training needed to create quality results that match your vision and budget. One issue that can quickly spoil the value of any project is moisture exposure. Today, we’ll discuss exactly how much moisture is too much, as well as the methods that homeowners and property managers can use to check for moisture infiltration. If you’re looking for professional assistance installing drywall for your project, be sure to contact us today for a quote! Many factors can affect the inherent moisture content of your drywall, including nearby water sources, seasonal changes, inclement weather, relative humidity, and more. Installing drywall during very wet, humid periods can result in hanging boards that are “too wet” for use. The gypsum construction within drywall makes it very susceptible to moisture, making it important for your drywall company to account for all humidity concerns before beginning work. Moisture content is commonly expressed as a percentage, subtracting the dry mass from the current wet mass and dividing it by the original dry mass to find amount of mass contributed by H2O. Higher MC contents can be indicative of serious problems. The concerns surrounding drywall are based on two risk factors — mold growth and structural integrity. To give you an idea of how sensitive wallboard is to moisture, wallpaper can resist microbial growth upwards of 11 percent moisture content. Concrete is porous, yet resists mold growth with moisture contents below five percent. If your gypsum board exceeds one percent, it can be deemed compromised. However, mold growth can begin around 0.6 percent, creating environmental concerns within the building. AZ Drywall Finishing is here to deliver comprehensive results that help to minimize the damages posed by moisture in its various forms. Our team understands the characteristics and behaviors of mold, and will help you avoid potentially dangerous and costly mold problems in the future. Moisture trapped in your walls and within your insulation can reside there for a considerable amount of time, springing mold growth in clusters within the drywall. The gypsum comprising your wallboard delivers rigid support and quality fire resistance, but only in the absence of moisture. Much of your commercial drywall can be saved if treated soon after water exposure, but saturation can compromise the core integrity of the sheet. Small amounts of water can be ideal when hanging drywall to achieve smooth curves and round surfaces, but heavy amounts will quickly sap any strength. The result is wet, soft, and downright unpleasant drywall that must be replaced. Saturated ceilings, for example, can quickly crumble and collapse to the ground, creating safety and environmental hazards for all of your guests. Even minor leaks can result in major damages throughout your facility. It can prove worthwhile to invest in greenboard that is more resistant to moisture, but remember that this wallboard will behave the same once its protective outer layer is compromised. Next time, our commercial drywall company will discuss the value of measuring the moisture content within your walls, as well as the importance of visual inspections when water complications are suspected. AZ Drywall Finishing is here to serve as your trusted drywall contractors across Chicago, delivering precise results that are done on time and on budget. Contact us now for assistance!